This week on Sips & Spoilers: a dark beer and a dark show. A quick summary: Two detectives in Louisiana join forces to solve a series of occultist murders. As the two men work with each other, they become deeply involved in the secrets of the Louisiana occult world…as well as with each others lives. This was a brew brought to me from the beer haven that is Asheville, North Carolina. Winter is coming (different show, I know) and that means it’s time for porters and stouts. Highland’s Coffee Porter is so dark, it’s almost like drinking a cup of espresso, but better…it’s a beer! The pairing: The word I used to describe the two above is the one I’ll use again now: dark. True Detective is bleak. Oppressively bleak. When I first watched the show, I went through it in one week, and I wouldn’t suggest that new viewers do the same. Detective Rust Cohle, one of the show’s main characters, is a depressed, alcoholic philosopher, a man so steeped in his own despair that he finds himself in the middle of America’s secret underworld by his own choice. There are characters, such as Marty Hart, that seemingly exist to balance the darkness with some light…but they’re exposed as creatures of evil themselves. Like I said: oppressively bleak. But the never-ending darkness isn’t invincible. There are glimmers of hope here and there, especially at the end of the show. They allow the darkness to take on a refreshing role for the viewer. Everything in True Detective feels real and visceral because, in the end, there seems to be a light at the end of the tunnel. Thunderstruck works well with True Detective. It’s undeniably heavy, just like True Detective. There’s no way to get around it. 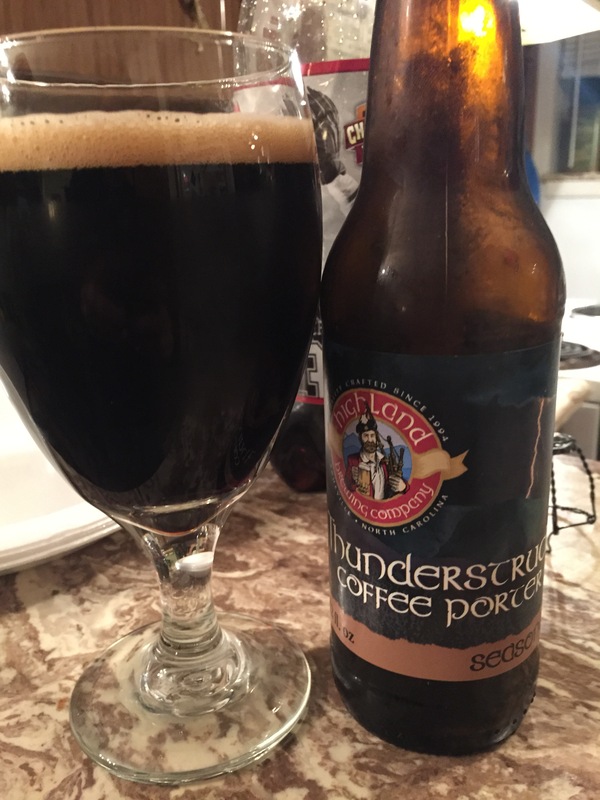 But while some coffee stouts and porters are more concerned with the coffee flavor, Thunderstruck is still a beer. It tastes like a beer and warms like a beer…it just gives you a distinct impression of coffee. True Detective plays like a horror story and feels like a horror story, but in the end it’s just a story. The completion of the story arc leaves viewers to contemplate big ideas and philosophies, but it also reminds them that things aren’t always as bad as they seem. The show and beer aren’t for everyone. But both are incredibly rewarding for those who choose to partake.